South Africa and Namibia by Private Train – The Great Canadian Travel Co.
On this exclusive, private train tour you will be taken on a journey of discover from Cape Town to the natural wonders of Windhoek, Namibia, a journey of around 3000km. Prices are shown in US$, per person based on two people sharing twin accommodation. Single use of cabin may be available on a limited basis, please inquire. See Tour Notes for details on the cabin categories. The African Explorer, your comfortable private train takes you all the way from stunning Cape Town to Windhoek, Namibia. ranked as one of the most beautiful cities in the world. The African Explorer private train also transports air-conditioned mini tour busses, for a maximum of twelve guests each, for your select programme of excursions. Your tour guide is a fund of fascinating information about the country and its people. For your comfort and safety a doctor is also on board your private train for the entire journey. Note: For 2017 this itinerary also operates in reverse as a 14 day/13 night program, starting in Windhoek and ending in Cape Town (except the 19 November, 2017 departure which returns to Pretoria). The 14 day itinerary includes an additional day of touring in Diamond City Kimberley on Day 12, followed by or the reverse itinerary are listed as such under Departure details. 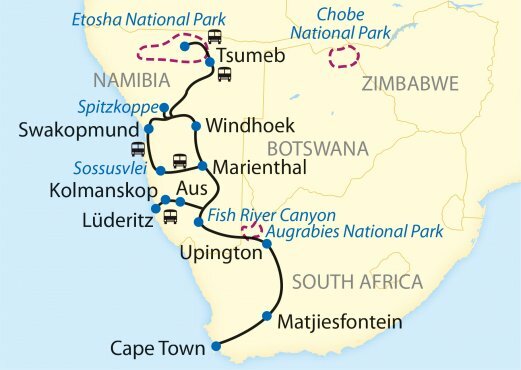 For 2018 this itinerary also operates from Johannesburg to Windhoek on July 11 as a 14 day/13 night trip and in reverse as a 14 day/13 night program, starting in Windhoek and ending in Cape Town. Elephant: There are five cars in the Elephant category, comprised of five compartments each. Each sleeping compartment in the Elephant category measures approximately 75 sq. ft./7m² and accommodates two guests in either two single berths or a double. Leopard: There are five cars in the Leopard category, comprised of three compartments each. The more spacious Leopard category sleeping compartments measure approximately 107 sq. ft./10m² and accommodate two guests in either two single berths or a double bed.